Windows can account for up to 30% of the heat lost from your home. You are literally throwing your money out the window. With heating costs rising all the time, the sooner you install energy efficient windows the sooner you can start saving money. Windows with a good WER will save you money. According to the GGF you could save up to as much as £461 per year on your energy bills, when upgrading to energy efficient windows. Window Energy Ratings provide the annual energy balance for a window and are calculated by taking the annual heat loss through a window and offsetting it by the annual solar gain through the window. An ‘A’ rated window gains more heat into your house through solar gain than is lost through the window. It is important in this day and age to reduce energy consumption in our buildings. 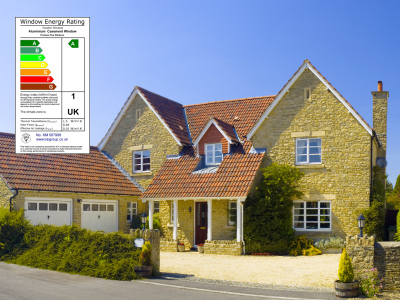 Window energy ratings were introduced into the building regulations in an attempt to help meet government targets for reducing carbon emissions. By installing energy efficient windows you could dramatically reduce your carbon footprint. Single glazed windows are poor insulators and heat loss is exacerbated if the window does not have effective seals. If you live in a single glazed house and install energy efficient windows, you could reduce the amount of carbon your home produces by 0.30 tonnes or 18% - almost reaching the Government target of 23% reduction per household between 2008 and 2012.